OUR BRAND- WDF Your one stop source for quality elegant disposable plastic tableware at discount prices! Our main products including plastic forks, knives, spoons, plastic plates, cups, bowls, dessertware, serving tray etc. Become your privately-owned party supplies. ABOUT US - Shop WDF PARTYWARE @ Amazon -WDF brand can be found in numerous stores and is recognized for quality, originality and style. DURABLE PACKING - Using sturdy wrap and more thick box can protect the party plates avoid any damage in transit! GREAT!!! ENVIRONMENT - Using food grade, non-toxic, BPA-free, durable materials can be recycled to help save the environment and reduce a carbon footprint. TIPS&ADVICE Disposable- Save clean up time to washing large quantities of plates. Reusable-Please clean and dry the tableware, stored in dry place for next use. Hand washable-Please wash durable plastic plates by hand, don't put into Microwave oven and dishwasher. Thank you for choosing WDF. Wish you enjoy a HEALTHY & HAPPY LIFE with our products. 1 package of Silver 7" plastic plates. Each pack has 100 plates. These heavy duty plastic plates are beautiful and have vibrant coloring. They will make any event look special. These colors are the most vibrant we have come across in any line we have dealt with to day! 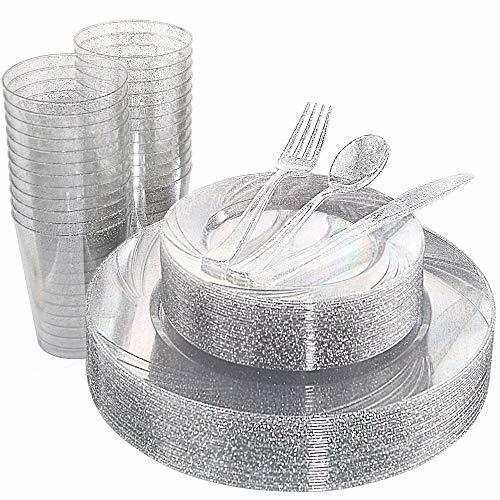 Specification: Material: Hard Plastic Color: Disposable plates with silver rim Product Dimensions: 51 pack silver dinner plates 10.25" and 51 pack salad / dessert plates 7.5" RECYCLABLE & BPA FREE : Enjoy a healthy life with those disposable plastic plates! Have a healthy and safety meal! PREMIUM QUALITY: Great size, great weight, and a beautiful design. The weight is good and it holds up well for all sorts of food. No worry about them leaking. 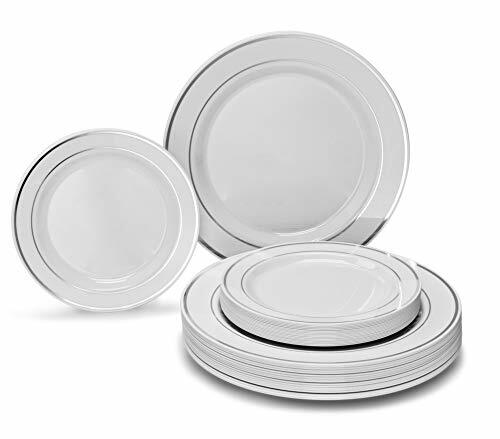 FANCY PLATES: Disposable dinner plates with elegant finish and exquisite appearance will add some elegance for your table setting and their premium quality will WOW your guests. 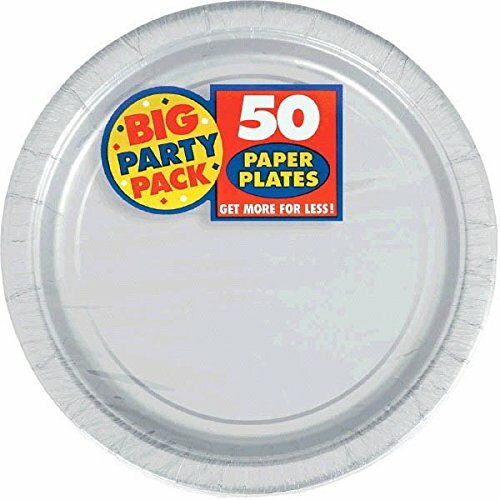 NOTE & TIPS: After party you can dispose these disposable party plates, dishwasher and microwave are not recommend. If you try to keep them and reuse them, please hand wash and dry them after using , Stored in dry place for its durability. 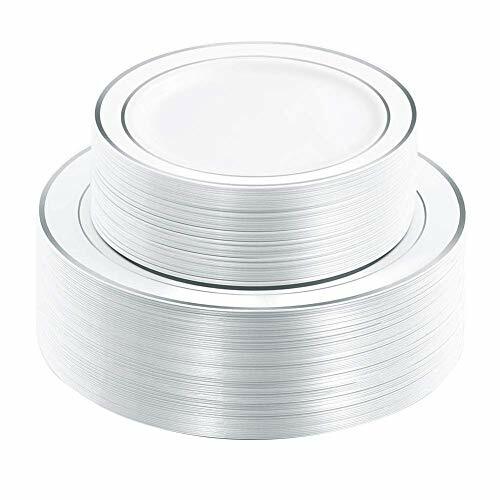 BEST CUSTOMER SERVICE TEAM Contact us if you are not satisfied with the silver white plates for any reason. We'll process full refund or send you a replacement without returning or any additional conditions. All issues will be solved within 24 hours. Thank you for your choices and support. Wish you enjoy a HEALTHY & GREEN LIFE with our products! OUR BRAND- WDF Your one stop source for quality elegant disposable plastic tableware at discount prices! Our main products including plastic forks, knives, spoons, plastic plates, cups, bowls, dessertware, serving tray etc. Become your privately-owned party supplies. ABOUT US - Shop WDF PARTYWARE @ Amazon -WDF brand can be found in numerous stores and is recognized for quality, originality and style. ENVIRONMENT- Using food grade, non-toxic, BPA-free, durable materials can be recycled to help save the environment and reduce a carbon footprint. DURABLE PACKING - Using sturdy wrap and more thick color box can protect the party plates and gold plastic flatware avoid any damage in transit! GREAT!!! TIPS&ADVICE Reusable-Please clean and dry the tableware, stored in dry place for next use. Hand washable-Please wash durable plastic plates,plastic silverware and cups by hand, don't put into Microwave oven and dishwasher. Thank you for choosing WDF. Wish you enjoy a HEALTHY & HAPPY LIFE with our products. OUR BRAND- WDF Your one stop source for quality elegant disposable plastic tableware at discount prices! Our main products including plastic forks, knives, spoons, plastic plates, cups, bowls, dessertware, serving tray etc. Become your privately-owned party supplies. ABOUT US - Shop WDF PARTYWARE @ Amazon -WDF brand can be found in numerous stores and is recognized for quality, originality and style. CONVENIENT TO USE -Add a touch of style to any event without the risk of broken ,Your guests won't know the difference between these heavy-duty silver plastic utensil and real polished steel ones. 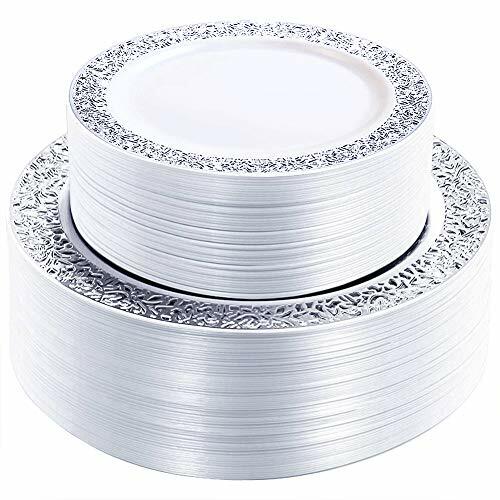 DURABLE PACKING - Using sturdy wrap and more thick color box can protect the party plates, silver cups and silver plastic flatware avoid any damage in transit! GREAT!!!. TIPS&ADVICE Disposable- Save clean up time to washing large quantities of plates and cutlery. Reusable-Please clean and dry the tableware, stored in dry place for next use. 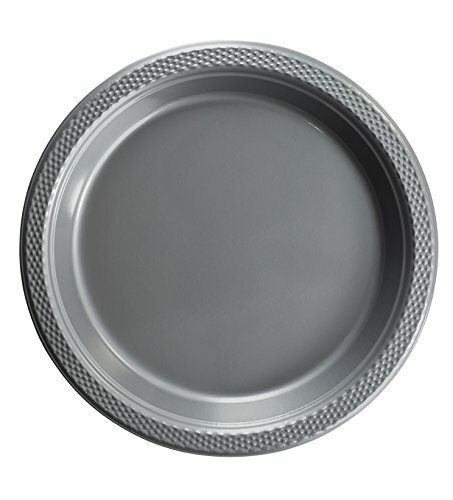 Hand washable-Please wash durable plastic silverware and plates by hand, don't put into Microwave oven and dishwasher. Thank you for choosing WDF. Wish you enjoy a HEALTHY & HAPPY LIFE with our products. 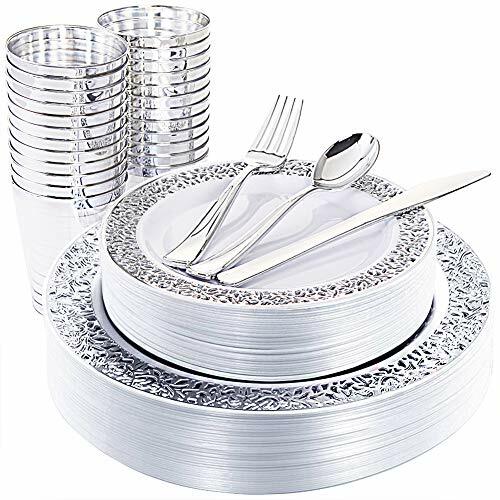 This Elegant 125 Piece Plastic Place Setting Set has a classic, refined look and design that makes it even more appealing than real dinnerware and silverware. 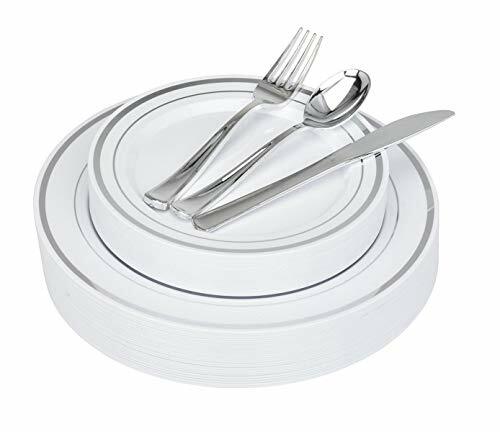 This service for 25 dinnerware set can replace conventional plates and cutlery for big family meals or special events and banquets. Your guests won't know the difference between these heavy-duty silver plastic utensils and real polished steel ones. These heavyweight plastic silver utensils are designed to withstand even the most temperature intensive foods while maintaining their form and shape. They will last through the entire meal till they are thrown out, or washed and reused for the next meal. Save clean-up time by throwing them out after use, while still enjoying the decorative and elegant accent they add to your event. Size: 7" " " Silver"7\"
Size: 9" " " Silver"9\"